What an incredible weekend this past weekend was! All of my hard work, persistence, and determination paid off yesterday morning, as I PRed by over 10 minutes at the Shamrock Half Marathon! I can’t wait to recap the half in full and share all of the ups, and downs, of both the race itself and the entire weekend. It wasn’t an easy weekend by an means, but neither has my training over the past two months. The most important thing is that I ran my first half marathon in almost seven months and PRed! We had a fabulous weekend in Virginia Beach, which included lots of great food, spending time catching up with an old friend, and enjoying a couple of hours on the beach. Yes, it might have been in the 50s during our beach time on Saturday, and I may have been wearing jeans and a jacket, but it was a gorgeous sunny day and I absolutely love any time that I get to spend on the beach. In the week leading up to race weekend, I continued to listen to my body and took it pretty easy on the training. Clearly, it paid off yesterday morning with my massive PR! QOTD: When did you last PR? This entry was posted in Shamrock Half Marathon Training, Training and tagged elliptical, half marathon, half marathon training, half marathon training plan, personal record, running, Shamrock 8k, Shamrock Half Marathon, Shamrock Marathon weekend, training, training plan, walking, weekly recap, weight training. Bookmark the permalink. Congrats on the big PR! Way to go! Congrats girl!! So well deserved!! I KNEW you were going to PR! 10 minutes is huge!!! Congratulations girl!!! Thanks Mindy! I kind of knew it too, I just didn’t want to jinx myself. Congrats on the PR! Can’t wait to read your race recap. YAY!!!! Congrats on the PR this weekend and I was totally living vicariously through all your pics on Insta. Shamrock looks like the most fun event! I’m down for this next year for sure. 🙂 You had such a great training cycle and I’m not surprised at all that all that hard work paid off big in the end! Shamrock was a blast! I’m already thinking about starting my 2016 race calendar and immediately adding this to the list of races for next year. So excited for your PR! Congrats!!! I last PRed at the half about a year ago, but considering that the last four 13.1 races I’ve done I’ve been pregnant for, I wasn’t able to push it as much as I wanted to. I’m looking forward to working toward another half PR in the fall! Thanks Amy! I have no doubt that you’ll PR shortly after Baby Fish is born. Congratulations! I PR’ed in my first half one year to date after I started running (2:10). I was injured a few months later and took all of last summer to recover. I ran two halfs this year so far, in 2:15 and 2:13, and look forward to breaking under my original mark again soon! Good luck with your continued recovery! Congrats! Can’t wait to read the race reports. 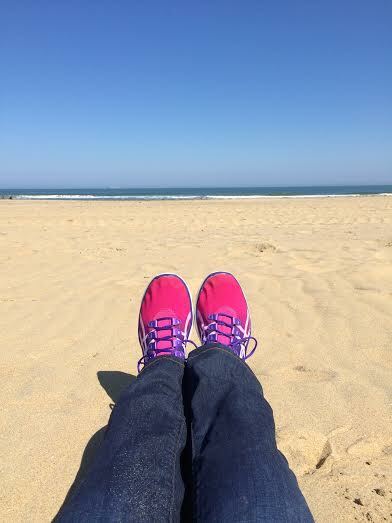 I hope the sun provided some warmth on the beach, even if it was in the 50s. congrats! can’t wait to read your race recap, kathryn! That’s so great! I know you had a tough couple of weeks a while back. Nice work! Thanks Deborah! It definitely hasn’t been an easy two months, but I’m so glad that I didn’t give up! Congrats on a great PR! I heard it was perfect race conditions for Shamrock! Thanks Pam! The weather was absolutely perfect for a race. hurray for the PR! awesome. Congrats on the 10 minute PR, especially with an 8k the day before – way to go! Congrats on the PR!! That’s incredible! Can’t wait to read the recap! Hooray for the massive PR! So exciting! You definitely had a great training cycle and did a good job with tapering. Can’t wait for the reacap! congrats on the PR!! Can’t wait to hear about this race–thinking about checking it out next year! And my last PR was on my half too! Over 7 minutes! Always exciting! Congrats on your 7 minute PR! 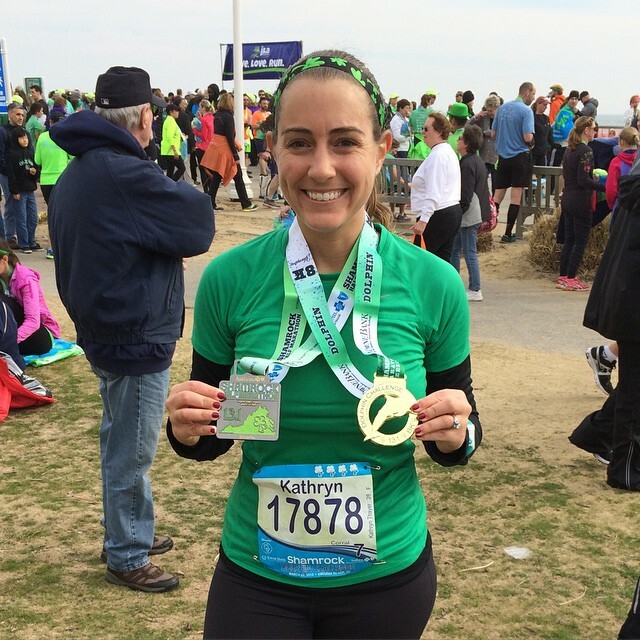 Shamrock was awesome – I highly recommend the race weekend! A 10 minute PR?! That’s HUGE! Congratulations!!! AWESOME!!! Congrats on the PR!!!! I was supposed to be in the marathon but I cancelled it a few weeks ago, all my blogger friends like you who were running it, were on my mind over the weekend. That is so awesome you did so well:) Woot Wot!!!! Thanks Kristy! Sad that you weren’t there – I would have loved to meet up! WAY TO GO! A 10 minute PR is amazing!! My last PR was a 5k nearly a year ago. I’m hoping this injury goes the eff away so I can start training towards some PRs this year. Thanks Ange! I hope you’re fully recovered soon! Congrats on the PR! I know several people who ran this one and it sound like an awesome time! It was such a fun race weekend! Way to go girl!! I did Shamrock 8k and loved it very much!! Glad you enjoyed Virginia Beach!! Way to work it!! Have a Happy Monday! Thanks Kristin! Glad to hear that you enjoyed the 8k. It really was a fun race weekend! Awesome!! Congrats on the PR! 🙂 My last PR was at the Philly Half Marathon last November. Have a great week!! Congrats on the PR! You did a great job training for this race. I haven’t had an actual PR in AGES and don’t expect one again anytime soon, but I did have a post-injury PR last spring when I finally got under 2:10 again for a half. I’m shooting for a marathon PR in the fall though. I’m sure you’ll get that PR in the fall! Congrats on your PR! I can’t wait to read the recap. I PR’d my last half, a week ago, as well! Woo hoo! Congrats on your PR, Wendy! Congrats on your amazing PR!! 🙂 I PR’d during Shamrock Weekend as well…both the 8K and half. Congratulations on a new PR. Those medals are awesome! Thanks Lacey! I’m in love with this year’s Shamrock medals! Congrats – a well deserved PR, you had a great training cycle 🙂 So glad we got to catch up again this weekend! See you soon and can’t wait to read your recaps! Woohoo Love that you were able to PR!!! That is the best feeling!! congrats!!! a 10 min PR? That’s awesome! My last PR was NYC Marathon in 2013…haven’t set a 5K or half PR in forever 😦 Maybe this year? congrats on your awesome PR! You worked so hard and did awesome! my last PR for the 5k was in Sept, 10k in december and half in october. i am hoping for a new 5k PR this spring! Nicely done! You worked hard for that PR! Well deserved!